Despite clear objectives, managers often make decisions on projects with uncertain outcomes, which can result in failed initiatives, missed goals and overrunning costs. A business case is a process, a tool and a document that builds consensus among stakeholders and gives decisionmakers the rational evidence they need to give the go-ahead. Making the Compelling Business Case shows readers how to champion new ideas and raise them to senior management; it simplifies the decision-making process by explaining the key theories and practices behind corporate investments. These methods can be applied to a variety of investment decisions, including strategic choices, capacity management, and budget allocation alternatives. This comprehensive and stimulating book features insightful case-studies and valuable hands-on tools, designed to help executives make smart decisions and to maximize enterprise value. Wolfgang Messner is Associate Professor at MYRA School of Business and Director of GloBus Research. He has been in senior management positions with leading companies (BMW Group, Capgemini, Deutsche Bank, The Information Management Group IMG) in Europe and India; Wolfgang has also taught as Adjunct Faculty at WHU – Otto Beisheim School of Management, Royal Docks Business School (University of East London), and the Indian Institute of Management Bangalore. He has written six books and now undertakes research, runs workshops and consults globally on strategic business transformation projects. Find out more about Wolfgang. 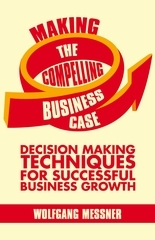 Tips and Tricks from the Author – How to Make Compelling Business Cases? Maximizing value for the enterprise, for its shareholders, and especially for its customers is the core of corporate business. And making business growth happen by extracting value from investments is what management is all about. Yet managers continue to pour billions of dollars into projects with uncertain outcomes. The common management response is to insist on business cases to select, justify, and manage investment decisions. Theoretically, this would be the right and effective approach – but what is a business case and how to build one? First and foremost, a business case is not something you can scramble together in a few hours and while having coffee with your stakeholders; instead, it is a project in its very own right, small but intense. Here are six essential tips and tricks from the author's consulting practice. Summarize the Business Case in One Sentence! What is the business pain point? What are we proposing to do? What will be done differently from tomorrow onwards? How much is the investment going to be worth - after all the costs have been taken off and risk is factored in (net present value)? What metrics do we use in order to make the investment measurable? To know more about the one-sentence business case, read Chapter 1. Know what Costs to Include! Not all costs are part of a business case. For instance, general overhead costs and anything which is not directly attributable to the investment proposition does not make its way into the business case. All costs which are already incurred before the business case investigation has started don't make it into the calculation either; such costs are irreversibly spent and cannot be reversed anymore. There are some more pitfalls, check out Chapter 3. 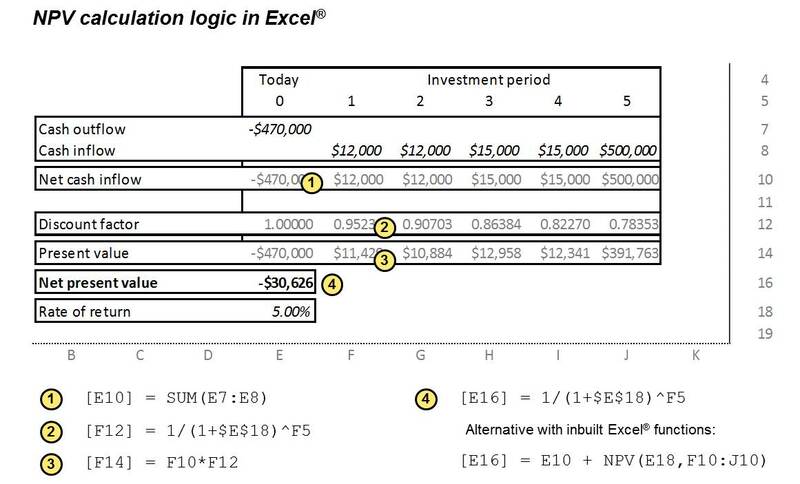 Only the net present value (NPV) calculation logic works for all investment decisions; internal rate of return (IRR), payback period, or return on investment (ROI) often look simpler at first glance, but are seriously flawed in certain conditions. NPV always gives you the right answer. Do you want to know why? - Refer to Chapters 2 and 5. Your Project does not come without Risk! Sensitivity and scenario analysis, simulations, and probability or decision trees will help you to understand the dynamics of your proposed investment. It often helps to start an initiative in a small way, collect empirical information, then fine-tune, calibrate, and subsequently scale big. A big-bang approach often fails; collecting experience and understanding the real world is essential to succcess. Read all about risk and uncertainty in Chapter 6. Spending a little more today and building a strategic platform for further activities can get your company ready with options to swiftly react to changing environments in the future. The cheapest option today is not necessarily the best one over the medium and long run. A management discipline called real option management knows mathematical ways and a Nobel-prize winning formula of making strategic flexibility visible in monetary terms. Chapter 7 introduces you to such advanced methods of business case building. Overcomplicated formula and endless assumptions do not add to your credibility; instead the tend to turn off senior management. 'I don't understand it!' is a reaction often heard in boardrooms across the world - and your business case is dead on presentation. Learn how to present a business case in Chapter 8. These were just some essential tips and tricks, but the book has much more to offer. Are you wondering about how best to manage stakeholders and include them into the business case process (Chapter 1)? Do you need to know how to convert 'soft benefits' into monetary ones (Chapter 4)? How do you ensure these benefits actually get reaped in (Chapter 9)? Do you want to use a business case as a sales strategy (Chapter 10)? - Check out the book's table of contents for more!